We could hardly sleep on Tuesday night in anticipation of finally moving freely through the park for the first time in over two weeks. We were jubilant that the State of Tennessee had made the decision to open the park for five days in spite of the shut down and planned our itinerary quickly. We began, yesterday, in Cade’s Cove which is a drivable eleven mile loop, dotted with historical buildings and fields that shine a light on the idyllic life led here by settlers before the Government took over (after they took it over from the indigenous people, that is). Cade’s Cove is rumored to be resplendent with wild life. Bill was particularly looking forward to Elk and White Tail Deer who are in rut. We saw turkeys. 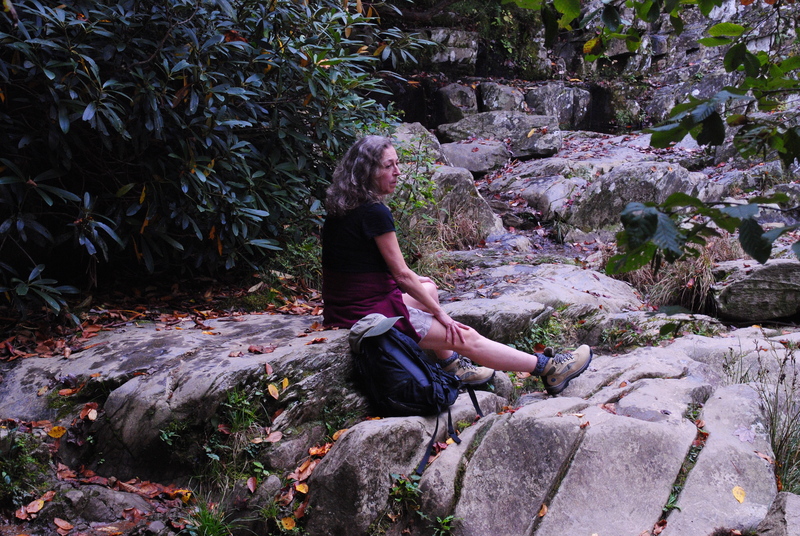 Somebody had recommended that we stop along the loop at the Abrams Falls trail head and give it a go. We hiked a five mile, moderate trail which wound around, up and down rocky sand stone outcroppings. It was a little rough, even in hikers. I’m not yet convinced to attempt a strenuous hike. I was amazed that a woman from Missouri was walking it in flip flops. Some people are made of more mettle or idiocy than me. The falls were lovely and we enjoyed our lunch of peanut butter and jelly, hard boiled eggs with salt, grapes and cold water there. There were a great many people taking advantage of the fair day and the park access. I needed to stop at Sugarlands Visitor’s Center on the way back to put money in the honor box at the head of Fighting Creek Nature Trail for the printed narrative which we had borrowed when we walked that path earlier in the week (another settlement, much like Cade’s Cove, except walkable and quiet). There is a lovely wildlife museum at the visitor’s center. I can see why they liked my work. The center was packed with people and they were throwing money in the honor boxes left and right. One of the rangers was emptying them as fast as they were filling. (I wonder who does the accounting for the Association.) I’m sure there was much happiness over the opening and subsequent crowds. I can’t help but think about how much revenue was lost over two weeks. Surely this is big business; environmentalist business. And, I question any validity or wisdom in the decision to shut down the Nation. Who walks five miles over rocks in flip flops? It’s ludicrous. I see turkeys. They’re everywhere. They don’t know they’re turkeys. I used to see turkeys in my back yard as they wandered by via everyone’s yard. But I’d rather be where you are! So glad you can now wander freely too. Hope you& Bill are having a wonderful time there. You mentioned the Visitors Center people liking your work; is any of it for sale there? We have enjoyed your sub, Nicolette. She’s personable, patent, informative; we’ve been doing enameling on copper (am I repeating myself?). I like her, but I miss you!